The Illustrated guide to the Vedic universe is an art book project which aims to create an illustrated reference guide depicting the people, places, things, and beings mentioned in the Vedic literature. The project aims to create authentic drawings of the places, gods, beings, animals and people as mentioned in the various Vedic literatures. The project is by Rasikananda from Mayapuri in India. If you are interested you can help in the project and also fund the project. 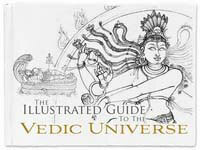 More details about The Illustrated Guide to the Vedic Universe project can be found here.